I only love a place after I leave it. I love the longing more than the experience. I miss Seattle’s green. I miss my small neighborhood where work was a short walk from home. I miss the comfort of post-college community, that group you’re forever bound to because you entered adulthood at the same time. Sometimes I even miss the church, its close proximity to Greenlake, my real sanctuary (as all bodies of water tend to be), and that sense, however fleeting, of belonging somewhere. I miss Portland, where I was allowed to be equally ambitious and reckless, where those two traits could co-exist with ease. The brunch and the cheap beer and boys on bicycles. I miss the bar trivia and flirtatious friendships and Mt. Tabor Park, jogging around the reservoir or watching the sun set from the top of the dormant, lazy volcano. I don’t know yet what Brooklyn will become to me, whenever I do leave it, which I inevitably will. I’m not made for staying. 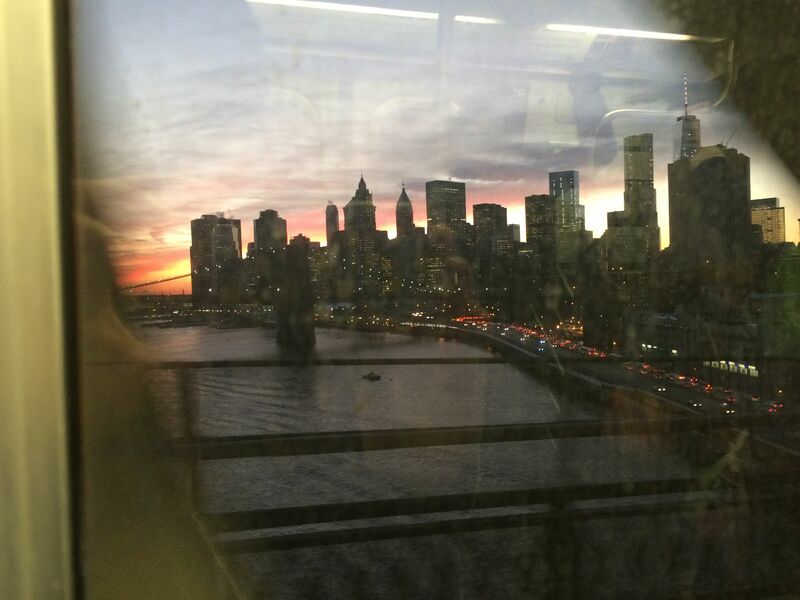 New York City through a dirty subway window. There is must and there is should. What we must do and what we should do. Most people follow the latter. It’s the should that led my parents from California to Idaho to Washington, following my dad’s job, pulling the roots from their adolescences to plant new roots for their children. It’s the should that led me from Washington to Oregon to New York. It’s the should that binds me now. It’s the should that separates me from my community, the home of my youth, and it’s the should that stills me, though my insides scream for movement. I’m coming up on two years in the same apartment. Not since I was a teenager have I lived in the same place for two years. Not since my childhood home. I’ve leapt from apartment to apartment, city to city. I was supposed to move to California this fall, but should kept me here. I thought momentarily it was must. I’ve lost friends and lovers to should and must, theirs and my own. (I wish I were bigger than this city you chose. I wish I transcended boundaries and borders, the geography that binds you.) I wish sometimes that my must meant staying put. I wonder at the restfulness of stopping, nesting, and watching my roots reach out like hands grasping for other hands. I have those roots that grew to me, from my parents, those roots that stretch the length of my life and act as a safety net, an umbilical cord I may tug on when I feel adrift, an invisible string that spans the length of this country that I can always grab hold of to guide me back. But no roots extend from me, and I’m not sure they ever will. I am rootless; the notion to stay is like a barren desert inside me with no water to sustain the roots. They cannot grow because I don’t stay long enough for them to find water. I am chasing that water and I am running from it. I should stay put. I should lay roots. But I must run. I will leave behind me a trail of broken roots and false starts. I am like a feather in the wind. It is nothing when it stops, when it stays motionless on the ground, but it is beautiful when the wind carries it past you.